Discus fish can be a challenge to keep. Keeping them in favorable conditions will make them achieve their desired maturity size depending on the type of discus fish. These favorable conditions are water temperature, hygiene, proper feeding, fish tank water pH and other elements levels and so on. Not all discus fish however are able to grow to their maturity size. These discus fish are what we refer to as stunted discus. 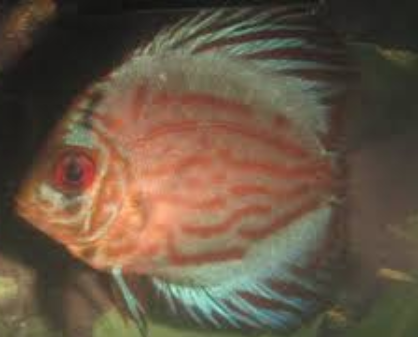 This article will discuss this type of discus fish in detail. The most obvious cause of stunted discus is failure to stick to the favorable conditions for the fish tank. One of the conditions under concern is on the feeding of the discus fish. Failure to feed the discus fish properly may lead to stunted discus. On this, the “cleanest” food to give the discus fish in order to avoid stunted growth is high protein flake food. This provides good proteins to the discus fish. Heating of the fish tank water is also of concern. If you find the weather is just fine there is no need to turn the heater on. If however your fish tank is in an air-conditioned room please turn your heater on in order to keep the temperatures favorable. Also, another possible cause is failure of the small discus fish to adapt to the new environment. It is therefore advisable if possible not to buy small fish when you have a planted fish tank with discus. It is better to buy adult size discus from the start. Finally, the most common cause of stunted discus is overcrowding of the fish tank. Discus fish require a minimum of 5 gallons of water per fish. 10 gallons of water per discus is the ideal situation. Stunted discus fish may also result due to lack of sufficient air in the fish tank. To solve this, do make sure the air pump is working well as high temp has lower oxygen. Another possible cause of stunted discus outside of the favorable conditions is the medications used. There have been some instances where small fish growth suffers from medications. Medication seems to stress the small fish more resulting to inhibition of their growth leading to stunted discus. To solve this, as much as possible be careful not to use any form of medication whenever it is not necessary on small discus fish. 1. The shape of the fish resembles a football or a bullet. 2. The eyes of the fish are very large in comparison to the size of the body. 3. The eyes of the fish are different sizes one being larger than the other. 4. The eyes of the fish are not properly aligned one being higher on the face than the other. 5. The fish remains the same size while others in the tank are growing. Can stunted discus fish grow to their full potential? Once the discus is stunted, it cannot be grown to the fullest potential; however, some stunted discus can still grow to an average shape and size. Now, I said fullest potential because different breed of discus have different genetic potential that allows them to grow into a certain size and shape. A stunted discus A with a potential to be 8″ can still grow to a 6″ fish, while a stunted discus B with a potential to be 6.5″ can only grow to 5″. There is also a varying degree of “stuntness”, and how big a stunted discus can grow depends on how long and how badly the environment it was living in was. Just because you have a stunted discus doesn’t mean it won’t grow. The best you can do is ensure they get good food and good water as discussed above and see how they turn out. Just because it’s stunted, doesn’t mean it isn’t otherwise healthy though. I believe a stunted discus is beyond any hope of growth in size. They can however still continue to live and maybe reproduce too (if the sexual reproduction devices were not damaged). Stunted discus has more intense colors if it’s any consolation. They just cannot grow big anymore to their fullest potential. Otherwise, they are just like their sibling and able to reproduce. Stunted fish pass on their genes and not their poor growth. Try not to breed them however as it will bring forth lesser fish into the gene pool.